Trekking to Australia is an air travel endurance contest, but the experiences are well worth the tradeoff. If my words are jumbled, forgive me. We’re still working through jet lag after our return from our two-week sojourn to Australia. It was an exhilarating adventure. We’ll cover our travels in several posts in the coming days, starting with the first leg of our journey. You’ll need a power converter to charge phones, laptops and things like electric razors. A plug adaptor won’t do the trick, since the current needs to be stepped down from 230 volts to the 120 that’s used in the US. I found the Foval converter (about $36 US) that has two outlets and four USBs to be excellent. For the first time, I used travel cubes for packing. I got a six-cube set from Bagail for about $25. This allows you to compartmentalize your suitcase. I had shirts in one, shoes and socks in another and my technology things in another. I found it very helpful, although my wife prefers plastic “vacuum” bags. Before our trip I purchased a couple of nice sound-cancelling headphones. We got the highly rated Plantronics BackBeat Pro 2. The cost is about $199 each. These are essential to keeping your sanity on the long flights. Recalling our struggles with large suitcases on a train in France a number of years ago, I was determined to travel light. I found that two of our lodgings had guest laundries. I packed just a bit more than a week’s worth of clothing and then did laundry at a mid-point of our trip. This allowed me to pack a smaller suitcase. Weird as it initially sounded to me, we wore compression socks for our flight. This improves circulation and helps avoid blood clots. Here’s some information about why this is a good idea. For travelers from the US, the most daunting aspect of the trip is the air travel. Traveling from Raleigh, NC, we had a five-hour flight to Los Angeles, a four-hour layover, then a 16-hour flight to Melbourne. We flew American to LAX and then were on Qantas. We found the service to be good on Qantas. They’ll serve you a number of meals, including a big dinner or lunch after which they dim the lights to give you a chance to sleep. If you can. There are things you can do to make it a more comfortable flight, but at the end of the day, you are hurtling at 30,000 feet in a metal tube for hours on end. It won’t be the most enjoyable part of the trip, but the end rewards are worth it. For our trip, we used a travel agent who arranged all our lodgings, flights, transfers and tours, based on our directions. We found this to be a nice arrangement, as our preference is to have customized travel as opposed to group voyages. 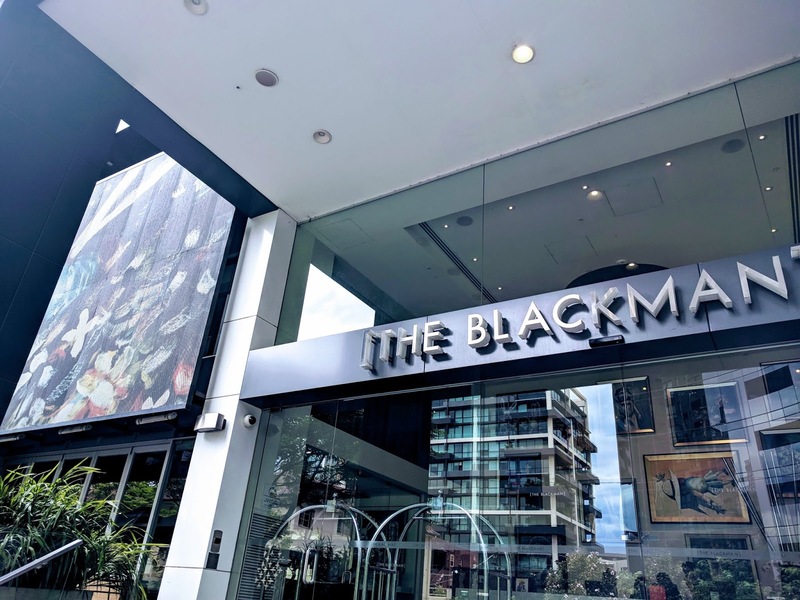 Upon landing and standing in endless line after line to clear customs, we found our shuttle and headed to The Blackman, our hotel accommodation on St. Kilda Road. The Blackman is inspired by famed Australian artist Charles Blackman. Blackman’s best known works are inspired by Alice’s Adventures in Wonderland. The hotel is modern and stylish and we had a spacious studio suite balcony. The room featured a refrigerator, microwave and a well-stocked mini-bar. The hotel is outstanding with our only complaint being that it is not in the central business district. There is a dearth of dining and entertainment establishments around the hotel (although a couple of nice restaurants in the hotel). The Blackman is close to a tram stop. Although we used it once, deciphering the tram system timetable was a daunting task. Melbourne is Australia’s second largest city at about 4.8 million. It also is rated as the second most livable city in the world (behind Vienna). Sydney (No. 5) and Adelaide (No. 10) are also on the list. The city is home to some of the best known cultural institutions in the country, including Melbourne Cricket Ground, the National Gallery of Victoria and the Royal Exhibition Building. It also hosts the Australia Grand Prix and the Australian Open, which we would attend. 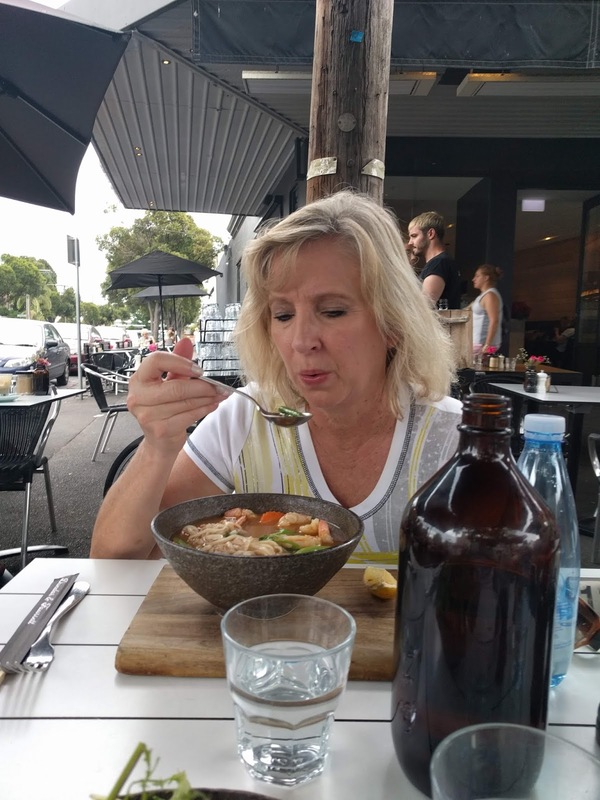 Before heading to the Australian Open, my wife decided she’d like to take a walk to Port Phillip Bay. The walk was long but delightful – under the scorching Australian sun. Although the skyline is dominated by wonderful modern architecture, Melbourne at its heart is a Victorian city. 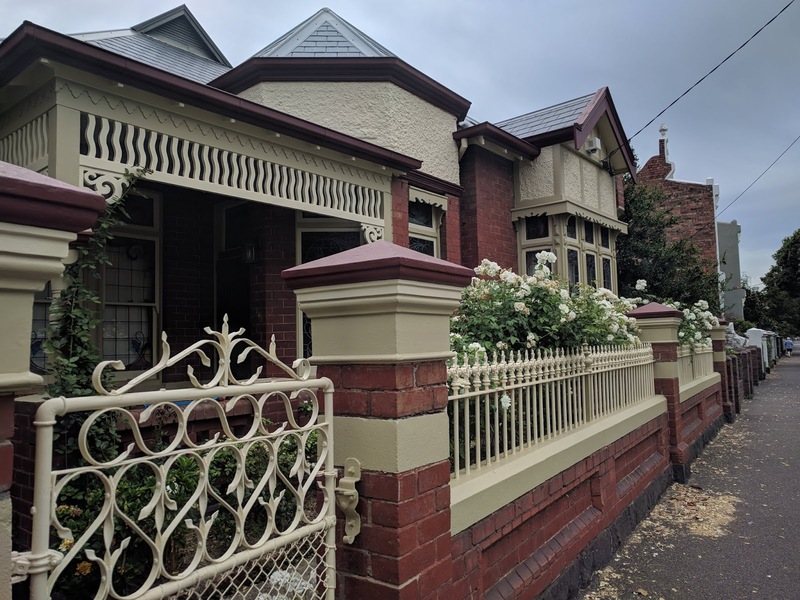 Prior to our visit, I always considered New Orleans to be the wrought iron capitol of the world, but the new winner is Melbourne. Wrought iron adorns the majority of historic homes we saw and most also include a flower garden in front. Due to the heat, long walk and an unfortunate choice of shorts, my thighs were chaffing raw and I was getting a bit testy. Chalk it up to the long flight! On our return jaunt, we walked through the charming area of Albert Park. There we stopped at the Dundas and Faussett Café and were soon rejuvenated by chilled beverages and lunch. I ordered the Thai Beef Salad and Green Dragon enjoyed some Tom Yum soup with prawns. The outdoor setting was perfect for chillaxing! On To The Australian Open! Yes, I’m a tennis player and fan. We started organizing this holiday long before I realized that the Australian Open would be going on during our visit. The stars aligned and we had an open day in Melbourne during the Open. We had hoped to see Roger Federer in action, but when the draw was announced, I could see that wasn’t happening. 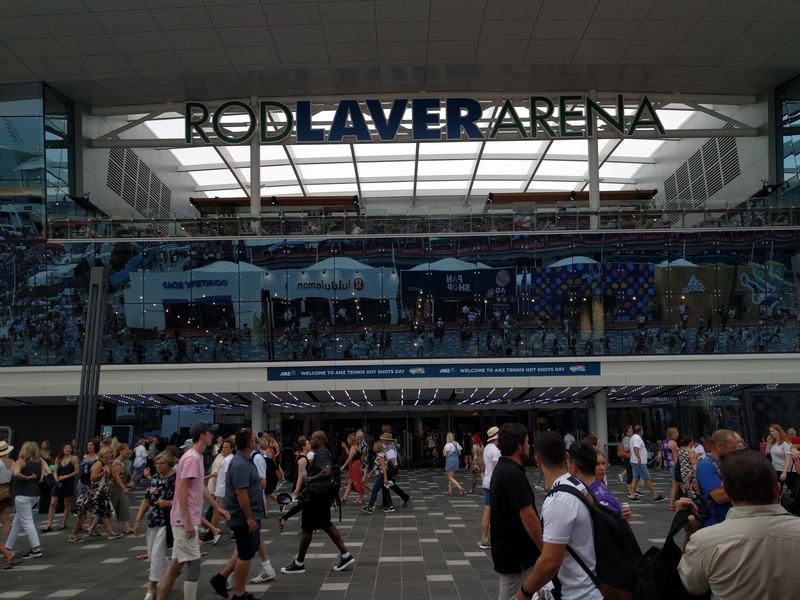 We had tickets for a night session at Rod Laver arena, the venue for the showcase matches during the tournament. The Australian Open is known as the “Happy Slam” and we can see why. 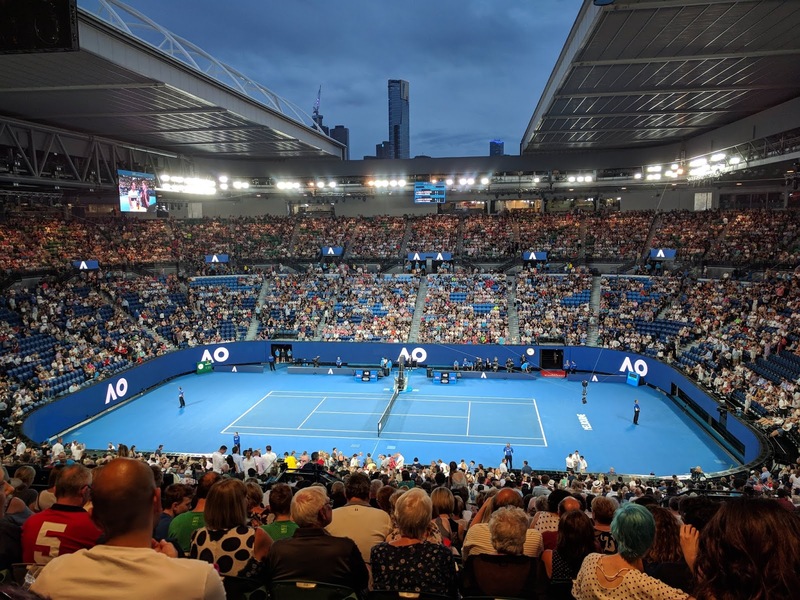 The location for this Grand Slam event is right along the banks of the Yarra River and the grounds are festival-like, with food, beer and wine and music flowing freely. We enjoyed a burger and some beer at the Coopers beer garden. We didn’t see Fosters at all during our visit, the formerly Australian beer is now owned by an international beverage company. We also fortified ourselves with Champagne from the Piper Heidsieck pavilion. An afternoon session match featuring Simona Halep ran late, meaning our entry into the arena was delayed by more than 90 minutes. Since I was late in ordering tickets, I was concerned that our seats in the upper level might be in the stratosphere. We found our seats and the location was better than hoped for with a very good view. We settled in for some great action with some legendary tennis players. The opener featured icon Serena Williams versus Eugenie Bouchard. Serena showed why she is considered the best female tennis player of all time and quickly dispatched Bouchard. Novak Djokovic was featured in the second match against Joe Wilfred Tsonga. This was an early round match, but Djokovic played almost flawlessly and that caliber of play would ultimately carry him to the championship. Tsonga battled in the second set and despite some inane fan continuously urging him on with shouts of “It’s your night, Willie,” and “You can do it, Willie,” Tsonga dropped a closely contested second set and was bounced out in straight sets. The tennis didn’t wrap up until almost midnight. When we exited the grounds, the trams were no longer running and the taxi queue was at least 50 people deep. We walked down the street and flagged down a cab before he reached the taxi stand and were soon whisked away to our luxury accommodations and some well deserved sleep. More installments of our Australian adventure are forthcoming. Australia is a wonderful destination for American travelers and Melbourne is a world-class city that deserves a week or more on its own.